Your pool should be sparkling clean and ready when you are, but it doesn’t keep itself that way on its own. Maintaining the beauty and function of your pool requires routine care throughout the summer. One of those chores includes choosing and using the right chemicals. Follow this simple guide to make sure you are choosing the chemicals you need to keep your pool beautiful and inviting all year. Your pool needs sanitizers to keep it clean and safe for your family. 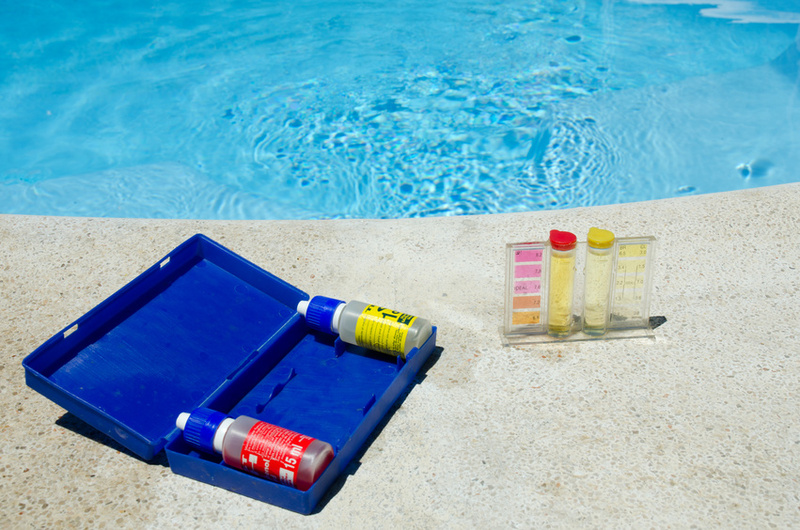 These chemicals are used to sanitize or disinfect your pool and water. They kill bacteria and inhibit the growth of both viruses and algae. Because foreign objects can be introduced to your pool from wind, rainfall and swimmers, it is important to keep them under control. While removing plant debris and other foreign objects may seem like the best solution, they can introduce bacteria and viruses to the water that you can’t see. They must be killed to keep the water fresh and sanitized. This typically means treating the water with chlorine or bromine. Both are available in several forms. Tablets or Sticks – These are the most popular and least expensive method to use for maintaining your pool. They dissolve slowly and to maintain the chlorine level. They do not require maintenance other than replacing them after they have dissolved. They are ideal for small in-ground swimming pools, above ground swimming pools and spas. Granular– Granular formulas work quickly, but do require premixing in a bucket of warm water. It must be added to the pool daily to maintain proper levels. Liquid – Liquid chlorine works quickly, but has a shorter shelf life, which means you need to be conscientious about stocking enough chlorine to meet your needs without buying more than you need and letting it go to waste. The pH level in your pools tells you how acidic the water is. It is an important factor in keeping the water safe and soothing to your skin. It should be maintained at a level between 7.2 and 7.6. This also helps chlorine work its best to keep your pool sanitized. Levels that are either too high or too low can cause burning eyes and dry, itchy skin. Your pool may need adjustments to the pH level every 1 to 3 weeks depending on the weather and how often your pool is used. Raising the pH – To increase the pH in your pool you will need to add a base or alkali, usually sodium carbonate. The pH levels in your pool can drop as a result of acid rain and heavy rainfall. The most common problem with pool pH is a high pH level. Lowering the pH – To lower the pH levels in your pool you will need to add an acid. The most common forms are muric acid or sodium bisulfate, but sulfuric acid and nitric acid can also be used. High pH levels are typically causes by exposure to the sun, wind and swimmers. Think of pool shock as a quick cleanup. When the chlorine in your pool binds with ammonia and nitrogen it becomes ineffective and causes issues such as jock itch. Applying shock to your pool removes the chlorine that has bound with other chemicals and cleans the water. You should shock your pool every week to keep the water fresh and clean. Algaecides – If algae is a common problem in your pool, an algaecide will help to prevent algae from growing on surfaces. Clarifiers – These work to cause tiny particles of debris to coagulate so that they are large enough to be trapped in your pool filters and removed from the water. Enzymes – These work to break down grease, oil and scum from the water and to remove odors. Metal Magnets – This works to bind trace amounts of metals in the water to prevent them from staining the surfaces of your pool. Keeping your pool clean and safe takes work, but you don’t need to do it alone. We provide weekly pool services under a monthly contract and test, treat and clean your pool on each visit. We can also make repairs and spot potential issues before they become a major problem. Contact us today to learn more about how we can make your life easier by maintaining your pool for you.